West Lafayette Superintendent Rocky Killion (at left, with microphone) says even his highly-rated school corporation might suffer from a new teacher pay formula pushed by Republican lawmakers and Gov. Eric Holcomb. Democrats have complained too much money is going to charter and virtual schools, and they claim the governor’s proposal to free up dollars elsewhere isn’t likely to translate into larger paychecks for classroom employees. State Rep. Chris Campbell (D-West Lafayette), who was elected to her first term in November largely on a platform of improving teacher pay, says she thinks even if schools can free up those dollars, needs such as building maintenance will come first. 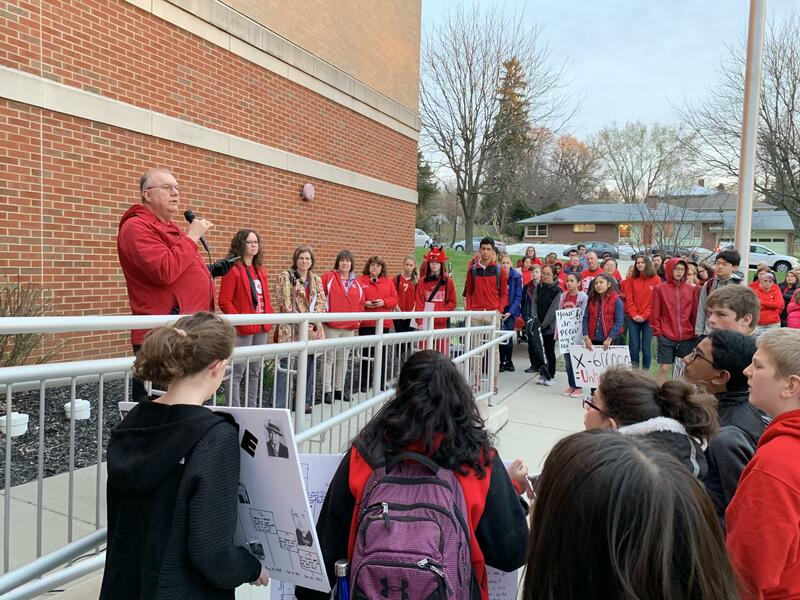 Indiana State Teacher’s Association President Teresa Meredith addressed a crowd outside West Lafayette High School, noting an apparent disconnect between how the state’s business community and Indiana teachers are treated. A recent study shows Indiana teachers have seen the smallest pay hikes in the country since 2002. Still, teachers at the West Lafayette rally say they’re not ready yet to walk off the job as West Virginia teachers did in early 2018 and early 2019.